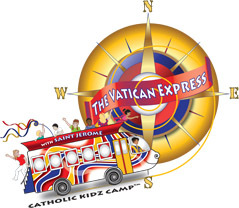 This week I'm very excited to be a part of our Church's Catholic Kidz Camp (also more well known as VBS) and lead 20 rising 2nd graders through Vatican Express by Growing with the Saints! This program looks excellent as it shares so much of our beautiful Catholic faith with our children. 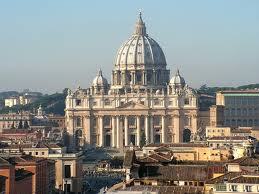 In 5 Faith Themed Lessons our children, as well as adults, will be reflecting on the Vatican theme. As a group leader I will also be doing daily readings from St. Jerome - Lion Turned Lamb that will entertain, enlighten and call kids to holiness. The story is a great one and I can't wait to share this fascinating story with the children! This is the first year our church is doing a program from Catholic publishers for Catholics where in year's past we have done programs from non-Catholic publishers that have very little Catholic teaching in the lessons. Everyone is very excited to aboard the Vatican Express, meet a member of the Swiss Guard and uncover the Vatican treasures this week! I want to especially thank our Director of Religious Education, Ms. Anne, for ordering and organizing such a wonderful and faith-filled program!